REACHING SUSTAINABLE DEVELOPMENT GOAL 6 – CLEAN WATER AND SUSTAINABLE SANITATION - gfa-groups Webseite! Achieving SDG 6 through sector-wide assistance requires the global community to work together closely and go the extra mile to “ensure availability and sustainable management of water and sanitation for all”. Despite many achievements, the sector continues to face challenges of increasing population growth and urbanization combined with the ever imminent threat of climate change and its effects. Through our work in the water and sanitation sector, we are convinced that the conservative approach of constructing water and wastewater infrastructure is necessary but will not achieve the goal alone. 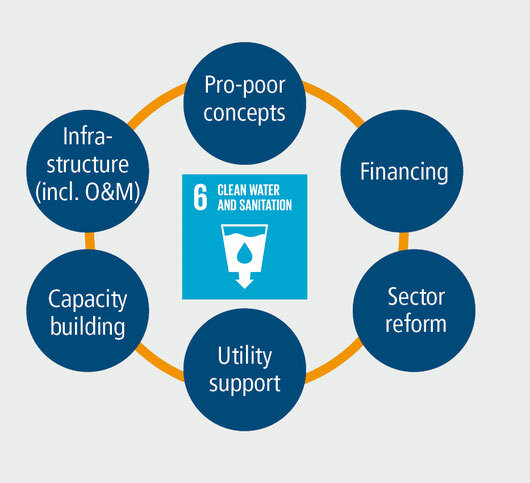 SDG 6 can only be achieved through a combination of methods such as increasing technical, financial and commercial capacities at an individual and organizational level, developing and implementing pro-poor concepts to reach the poorest and marginalized members of society, creating efficient and effective integrated sector structures, and channeling finances for efficient use in water and sanitation sector development. However, these concepts and approaches only come to life and turn into success stories through the people who are implementing our projects. They are our greatest asset. Only with them and the trust we have in their capabilities, and the trust that our partners, clients and beneficiaries have in them, our projects become success stories. The world has witnessed considerable improvements in the access to clean water and sustainable sanitation over the past decades. This was part of the achievements of the Millennium Development Goals (MDGs) 2015. However, it has become evident that the global community needs to go the extra mile to end poverty for even more people, enabling them to live a dignified and healthy life including clean drinking water and sustainable sanitation. The United Nations’ Sustainable Development Goals (SDGs) point in this direction. GFA Consulting Group is proud to contribute to the achievement of these goals by going the distance hand in hand with partners and clients. The SDGs are interlinked and complex in nature as efforts to achieve one goal will contribute to other goals. This is also the case with SDG 6 – Ensure availability and sustainable management of water and sanitation for all. This reduces environmental pollution and contributes to the conservation of nature. It improves the health of millions of people. It increases access to education for girls and creates decent job opportunities. It further ensures food security and improves the overall quality of life. With over two decades of experience, the GFA water and sanitation team provides solutions to reach complex goals at a worldwide scale. Through projects in Sub-Saharan Africa, Asia, and Eastern Europe, the company has worked closely with partners and clients to tackle SGD 6 from various angles. Water sector reforms, pro-poor concepts, capacity building in water utilities, financial management and fund management at various levels and sector institutions are cases in point. GFA’s main strength is the people behind the projects, ranging from project coordination at Hamburg headquarters to the international and national experts that turn concepts into successful best practices. This newsletter will focus on such people working on achieving SDG 6 through sector reform projects in Zambia, technical assistance to water and wastewater utilities in Ukraine, Burundi and Vietnam, and financing the water sector in Tanzania. 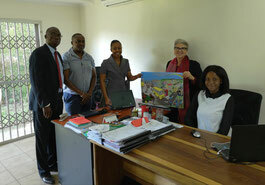 Could you briefly present your project in Zambia? Our team has been supporting capacity development since August 2015 in the Zambian water and sanitation sector, using an integrated collaborative approach. Based in Lusaka, our team provides technical and organizational development support to the Ministry of Water Development, Sanitation and Environmental Protection (MWDSEP), four commercial utilities and local authorities in four provinces, at the provincial and district level. Our primary intervention areas include support to the institutional and regulatory framework, and capacity development for rural and urban water supply and sanitation services. The latter includes process support in planning, monitoring and implementation, including cross-cutting issues such as gender, HIV/Aids and governance. Since November 2017, we are also supporting Integrated Water Resources Management (IWRM). All of our activities adhere to the Zambian National Vision 2030 and are therefore part of global efforts to achieve SDGs. 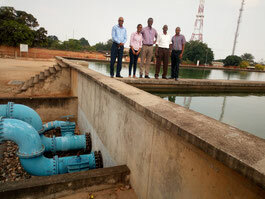 Have you experienced improvements in the Zambian water sector in recent years? The Zambian water and sanitation sector has experienced significant improvements over different organizational levels during the last years. Along with our partners and other actors, the GIZ program and GFA’s work have contributed to the improvement of both urban and rural water and sanitation, which has become increasingly decentralized. The Zambian government has established MWDSEP as a new ministry, which is a big step in raising the profile of water and sanitation. By implementing national programs and strategies, Zambia has taken steps that make it likely to achieve the SDG 2030 goals regarding 100 percent access to safe drinking water and sanitation services. Where do you see the strengths of this project? I think that the strength of our project is a combination of clear, shared strategic goals and procedures, collaborative planning and monitoring, and effective communication with GIZ and our partners and clients – and of course the people we work with, meaning a solid team of international and national long- and short-term experts. We are practical and flexible in the approach to our work, realizing that water and sanitation are clearly change processes. Even though we have established very good relationships, our partners are in demand by many people and by other projects, which may cause delays that are out of our control. We recognize that our work is a process in which we try to maintain a cooperative and collaborative approach – but that often requires more time. We continuously work at establishing sustainable activities and processes that are affordable to the Zambian institutions and that can realistically be maintained in the long run, even after our support has phased out. What will be future developments in the Zambian water and sanitation sector? We anticipate that the aspect of sanitation will continue to gain more importance in the near future, especially in addressing onsite sanitation and faecal sludge management planning and infrastructure development. The government appears to be committed to reaching the SDGs by 2030 and is engaged in learning and sharing with other countries and regions. What do you feel most passionate about in your work? 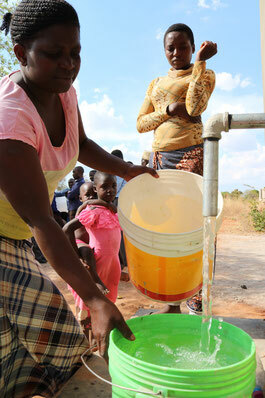 I think that it is exciting to work in this sector since water and sanitation are critical factors in everyone’s life. When I see people getting access to clean water or to a toilet for the first time, I realize that our work shows direct results. I appreciate that we work with an integrated approach starting at the top level where policies and regulations are made, and covering lower levels where the work is implemented and makes a difference in the people’s lives. I like to work in this surrounding where I feel energy and hope. Léonidas Niyungeko started working with GFA in 2007 in the GIZ-supported Water Sector Program in Burundi: Support to the REGIDESO. The latter is a public company responsible for urban water supply in Burundi. Since May 2015, when the program was partly suspended due to the political situation, he has been working as the team leader of the project. “The project greatly contributed to recent improvements in the Burundian water sector”, Léonidas Niyungeko explains today. As an example, the collection rate of the water service fee has grown from 58% in 2009 to 82% today. In addition, the rate of non-charged water meters has decreased from 30% to 14%. These indicators are important, since REGIDESO can only continue to provide long-term water services if it generates enough money to run the business. The project has also supported the set-up of a department responsible for the management of water kiosks and reinforced the delegation of their management to private operators, which is important to make the service efficient and sustainable. Analytic accounting and internal audit have also been introduced, which allow REGIDESO to control costs and manage the enterprise with optimized and efficient procedures. Léonidas Niyungeko thinks that in the near future it will be necessary to find financial support for the construction of more water infrastructure in order to get a step closer to SDG 6 by increasing the access rate to clean water. Currently this rate is at about 79% in urban areas. In fact, the rate has gone down compared to 2014 because of an economic slowdown, population growth and the decline in external finance. At the turn of the century, the Government of Vietnam (GoV) acknowledged the necessity for the creation of a coherent national framework legislation for the urban wastewater sector. In response, GFA Consulting Group was commissioned in 2005 to implement a GIZ sector reform program to assist the Ministry of Construction (MoC) and six cities to strengthen capacities and improve levels of service delivery. A GFA support cornerstone was the development of the 2007 GoV Decree 88 that laid the foundation for far-ranging sector reforms. A key innovation of Decree 88 was the acknowledgement of wastewater collection and treatment as a service in exchange for payment following the polluter-pays principle. Yet, due to low capacities at the local level, technical deficiencies and weak enforcement mechanisms, cities failed to put Decree 88 into practice. During further program phases, GFA assisted MoC in the identification of shortcomings and a complete overhaul of the decree. The much improved new framework was ratified in the 2014 GoV Decree 80 that guides the development of the sector until today. The good reputation that GFA successfully acquired as a result of the GIZ program has convinced other donors in the sector to choose GFA as a development partner. 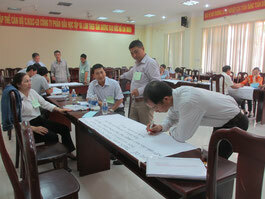 Since 2016, GFA has been implementing the Vietnam Water Sector Training Project financed by DANIDA. A key reason stated by DANIDA for contracting GFA instead of other firms was GFA’s reputation in shaping Vietnam’s wastewater sector through its ground-breaking pioneer work for over a decade. Many, if not most, public utilities in former Soviet countries face challenges in terms of self-sustainability and reliable operations. Since 2016, GFA Consulting Group has been supporting the Ukrainian Chernivtsi Vodokanal (CVK) water and wastewater utility through capacity building activities as part of the Municipal Water Infrastructure Project Chernivtsi funded by German Development Bank (KfW). Right from the start, a key implementer of the project has been deputy team leader Dmytro Tikunov, a local utility management and institutional development expert. Looking back at this concluding and successful project, Dmytro Tikunov is proud to have contributed to this “brilliant and complex” project. A key success factor he has identified is the trust and open communication between all partners that the GFA team has managed to establish. “In order to improve something, you need to know what needs to be improved. Thanks to our good relations and trust from our partners, we were able to get incredible amounts of information and were able to really understand the key challenges and sensitive issues that the organization was facing. This would not have been possible without our good communication and trust”, reports Dmytro Tikunov, who has organized and conducted various technical and capacity building trainings to address these challenges. This type of open communication and transparency has also been extended to CVK’s customers, who have positively acknowledged the newly developed public relations (PR) strategy based on a new strategic business plan assisted by GFA. With the PR plan, CVK has also picked up a new role as educator for civil society. A popular school event among participants and CVK staff has successfully helped the company raise awareness on sustainable water use and water pollution. Throughout project implementation, Dmytro Tikunov’s main concern has been to improve the overall capacity of the utility at all levels. “During our trainings, I usually say, nobody will invest in your problems. Potential investors will only invest in solutions.” In times of political challenges and increasing support from European donors and investors, this will be a major factor in the continuous support to invest in Ukraine’s water and sanitation sector in order to achieve SDG 6. 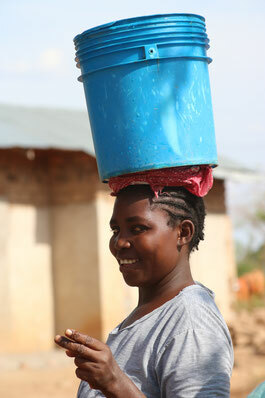 Urban Water Supply and Sanitation Authorities (UWASAs) in Tanzania have been providing services for years. Just like other public utilities, they have relied on government funding only for the coverage of capital expenditure, which limits the utilities’ flexibility in responding to investment challenges. This is where commercial loans have become a source of financing the Tanzanian water and sanitation (W&S) sector. For the first time in Tanzania, the Ministry of Water and Irrigation (MWI) together with KfW agreed to establish an Investment Financing Facility (IFF) to support water utilities to access commercial loans, and to set incentives for local banks to provide the necessary funds. Based on the achievement of agreed performance targets, UWASAs will be rewarded through bonus payments by the IFF. On behalf of KfW, GFA team leader Wolfgang Hützen and his team have been helping the utilities comply with the requirements and standards set by local banks. Once the targets set for each project are achieved and comply with the standards, the utility will receive up to 50% of the eligible investment cost as a grant through KfW. Initially, IFF supported four pilot projects that managed to receive their specific grant. Currently, there are two projects in Tabora and Moshi, which may qualify for a grant of up to 216,000 Euros and 378,000 Euros, respectively. The GFA consultancy covers assistance to UWASAs in preparation of adequate investment project proposals and loan applications for commercial borrowing, and assistance to MWI in guiding and overseeing the IFF. In addition, GFA is soliciting banks in establishing in-house capacities to develop a loan product for UWASAs. According to team leader Wolfgang Hützen, projects suggested for IFF funding should be analyzed sufficiently to properly evaluate the ability of utilities to pay back the commercial loan without jeopardising their operational cost coverage. IFF has succeeded in raising utilities’ commitment towards commercial borrowing, which resulted in the provision of clean water to new service areas at a regulated price. IFF has also contributed to good governance within the water sector by increasing financial discipline, efficiency, accountability and responsibility of UWASAs in Tanzania.